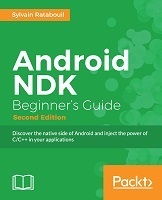 Android NDK is all about injecting high-performance and portable code into your mobile apps by exploiting the maximum speed of the device they run on. This book will show you how to create C/C++-enabled mobile applications and integrate them with Java. The books starts with teaching you how to access native API and port libraries used in some of the most successful Android applications. Next, you will move on to create a real native application project through the complete implementation of a native API and porting existing third-party libraries. Moving forward, you will learn how to access the keyboard and input peripherals and read accelerometer or orientation sensors. Finally, you will dive into more advanced topics such as RenderScript. Are you an Android Java programmer who needs more performance? Are you a C/C++ developer who doesn't want to bother with the complexity of Java and its out-of-control garbage collector? Do you want to create fast intensive multimedia applications or games? If you've answered yes to any of these questions then this book is for you. With some general knowledge of C/C++ development, you will be able to dive headfirst into native Android development. Sylvain Ratabouil is an IT consultant, experienced in Android, Java, and C/C++. He has contributed to the development of digital and mobile applications for large companies as well as industrial projects for the space and aeronautics industries. As a technology lover, he is passionate about mobile technologies and cannot live without his Android smartphone.